Last week I wrote about my first attempt to make homemade granola. It was less than delicious. In fact, it was burnt and I had to throw it all out. But nothing was going to stop me from trying again*, because if I've learned one thing in the kitchen, it's that a new recipe rarely turns out well the very first time. At least, it doesn't for me. For my second try, I used a friend's granola recipe. She claims it's a family secret. I wasn't sure whether or not she was kidding, so I'm not exactly sure if I'm allowed to share this. But I'm going to. You're welcome. Mix together so it's all coated. Put on cookie sheet. Drizzle honey all over. The obvious difference between recipe 1 and recipe 2 are the oven temps. 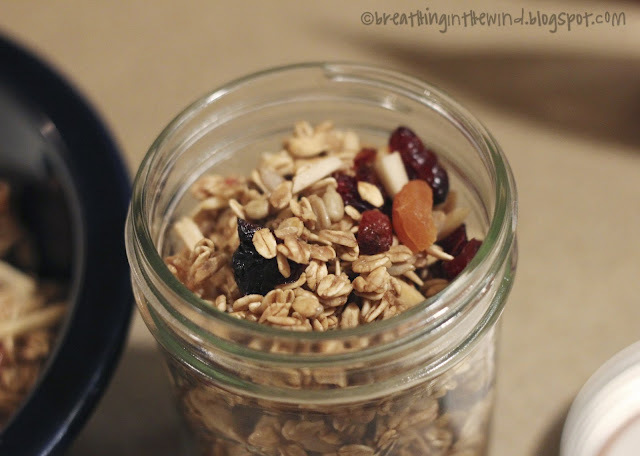 The first granola (the one that burnt) was at 350. This time, my oven was at 250. Clearly the 250 temp time is much better. My conclusion: this granola was quite good. It didn't get as hard as I would have liked, however. It was pretty chewy, which I think had to do with the honey I drizzled on top. After a few bites it becomes a serious jaw workout, but that hasn't stopped me from eating it all week. Next time, I might try cooking for longer or perhaps mixing the honey in with the brown sugar/water/vanilla mixture. I'll let you know what I find out. And again, granola tips are welcome. I'm still a newbie. *In related news, Jordan is getting a little tired of my granola experiments. Just a few days ago he told me that he keeps finding oats stuck to his socks. Oddly enough, this has yet to happen to me, so I can only assume he's crazy. 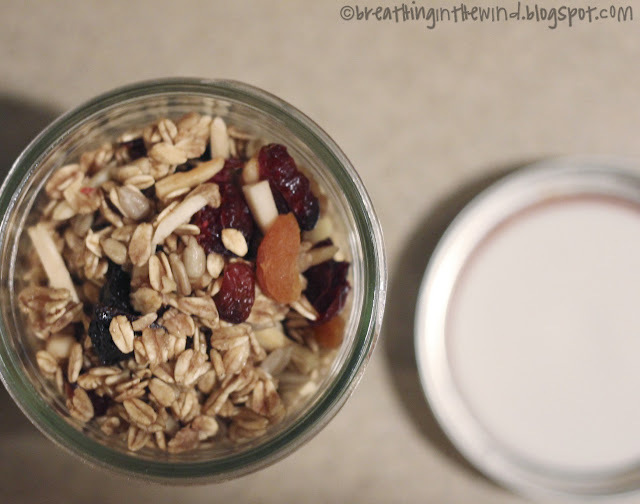 I make a really crunch granola... no water - just honey, maple syrup and vanilla. I bake mine at 225 degrees for an hour. If you want specifics let me know. This sounds sooo good! I'm going to make it tomorrow. The only problem when I do things like this in the kitchen is that I have a bad habit of eating the entire batch in one sitting. Especially when things come right out of the oven. 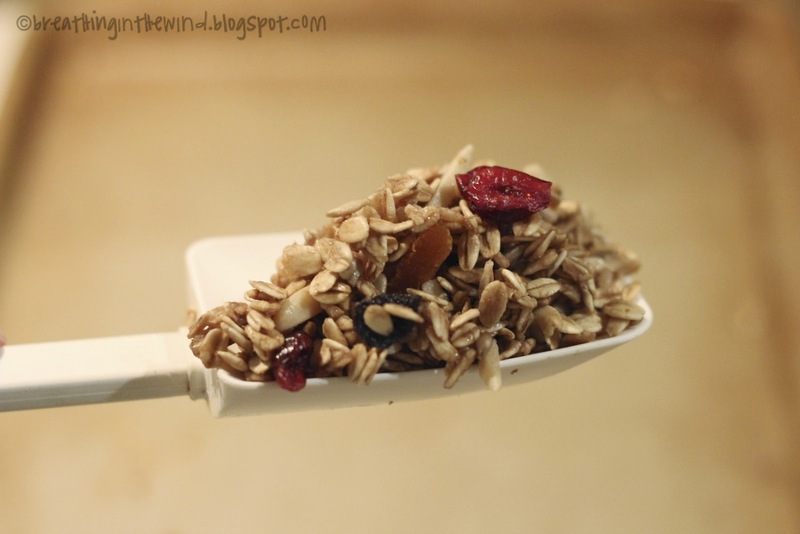 Honey-ish granola? It will hardly last a second. But it'll be a good second. One thing I would say is to add a pinch of salt... works like a charm!! (I did this with a different granola recipe and I feel like it made it perfect) Thanks!